The houses were bigger and the people richer in the places that the locals called "Swarthmore" and "Morton," compared with the simple farmland of the rest of 19th-century Springfield Township, Delaware County. The two sections were home to a college, growing businesses, and workers who commuted by train to the big city of Philadelphia. So the Swarthmore and Morton residents broke off from Springfield, carving out only the parts they wanted. Left behind was a piece of the township on the opposite end of Swarthmore that remains a place apart — a 2,000-foot-long island of land along South Chester Road with about 50 houses and a string of businesses that is surrounded by other municipalities. Swarthmore "did not want that section over there, because it was a quarry and it was farms," said Barbara Burke, vice president of the Springfield Historical Society and curator of its museum. "And they were just too snooty and that's why." The strange history of the Springfield boundaries provides one window into how Pennsylvania became the land of 2,560 municipalities, the third-highest number in the country. Across the river, a sore subject — consolidation of the smallest towns — is again being raised in New Jersey. A group of New Jersey lawmakers and tax and economic experts is tossing around the possibility of consolidating nearly 200 of the state's 565 municipalities as a means of saving administrative and service costs. Under the proposal — one of dozens of suggestions in early consideration by the Economic and Fiscal Policy Working Group — communities of fewer than 5,000 people would be forced to combine with neighbors. In 1850, Upper Darby, Darby, and Ridley were large townships that covered most of southeast Delaware County. Over the next 75 years, those three townships were splintered into 20 separate municipalities. Six of them currently are home to fewer than 5,000 residents. Note: Not shown is Eddystone, which was formed out of Ridley Township in 1888. On average, New Jersey municipalities are 10 times as populous as their Pennsylvania counterparts. So using the same population cutoff in Pennsylvania would require consolidating over 1,800 towns: It has better than four times as many municipalities as its neighbor to the east — and 75 percent of those have fewer than 5,000 people. Springfield is one of a few municipalities in the region that look like one of those erstwhile gerrymandered congressional voting districts that Pennsylvania was forced to redraw. Like Springfield, some have fragments of land that belong to them but are islands surrounded by other municipalities, as in Haddon Township, Camden County. Some boroughs are intact but totally engulfed by a bigger municipality, for example, Narberth Borough, which is inside Lower Merion Township, and East Lansdowne, which is in the belly of Upper Darby Township. Residents of these boroughs can find themselves justifying where they live to outsiders who know for a fact that a given address is in such-and-such town. Transplants and developers get confused about whom to call for services and permits. For various reasons, consolidation fever never has taken hold in Pennsylvania. Nor has it in New Jersey, but at least in the Garden State it has been a subject of serious discussion. How did all this fragmentation happen? Communities developed different identities and different wants. Rural areas balked at paying for urban areas' paved street improvements and lights. Urban populations bristled at paying for what farmers needed. A desire for local control meant residents didn't want to travel miles to the government building and wanted their own emergency first responders. "It created what today is seen as a problem," said Dennis Raible, treasurer of the Haddon Township Historical Society. "People don't want to give up local control. … The mentality then is what people would say today" as a reason against consolidation. Haddon Township's westernmost piece is shaped like an hourglass. The boroughs of Oaklyn, Audubon Park, and Audubon separate the hourglass from the rest of the township. William Penn had envisioned township boundaries in straight lines running at right angles to the Delaware River and the Schuylkill, according to Upper Darby's historical association. Clearly, that didn't happen. Pennsylvania's plentiful rivers, mountains, and valleys marked numerous municipal borders. Property lines, especially farms, are responsible for many of the strange boundaries that persist today. Odd boundaries and fragmentation often require close cooperation among police officers and other local officials. For example, Upper Darby, a township of more than 82,000, offers assistance to the smaller communities that broke away, such as Clifton Heights, said Mayor Thomas N. Micozzie. "We try to act as the big brother," he said. Upper Darby was the father from which several municipalities spawned after Upper Darby itself separated from the massive Darby Township in the 1680s, according to Delaware County Historical Society PA. Lansdowne (1.2 square miles, according to state data), East Lansdowne (0.2 square miles), Clifton Heights (0.6 square miles), Aldan Borough (0.6 square miles), and Millbourne Borough (almost 0.1 square miles) were all part of what was once Upper Darby. East Lansdowne is surrounded on all sides by Upper Darby. 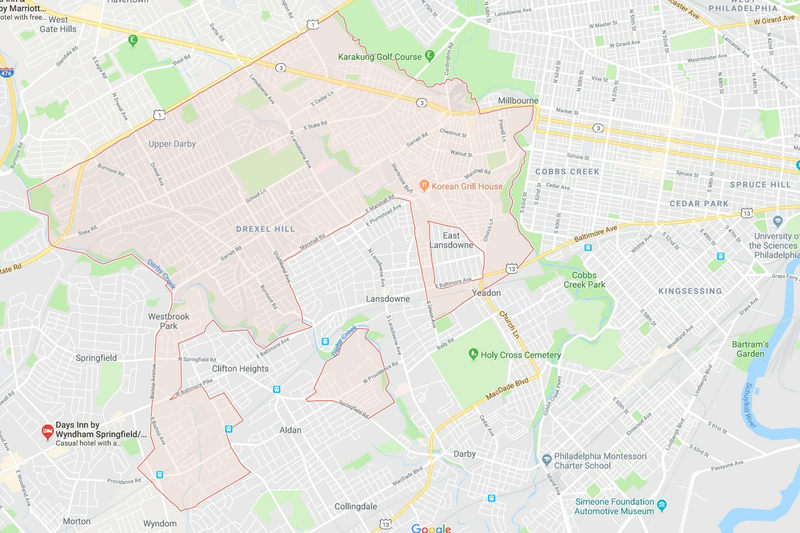 In the approximately 500-foot-wide isthmus between East Lansdowne and Lansdowne sits Danny's Corner Tavern, Doc's Deli, Empire Diner, and a couple of hundred homes. The businesses and houses are in Upper Darby. Before Micozzie became mayor of Upper Darby nine years ago, he was a councilman for the Second District — the arm extending from the township's southwest corner. Springfield, Morton, Collingdale, Aldan, and Clifton Heights all border the district. Those geographic realities present some challenges. Confusion abounds for new residents wondering whom to talk to about parking disputes on a particular street or which days to put out the trash. "It's like that all throughout the town," said Micozzie, who gave the example of a hypothetical resident with a Clifton Heights zip code wondering why she's getting a letter from the Upper Darby mayor. "If you didn't know, [you'd be thinking], 'What the hell's he talking to me for?' "
It wasn't until Micozzie was 16 and became a firefighter (a notoriously territorial profession) that he learned about Upper Darby's unusual boundaries. His fire company was responsible for Upper Darby's "island." "You think you're in one big community," he said. As mayor, he sends welcome packets to new residents partially to remind them which municipality they live in and where to go for services. This sign marks the beginning of East Lansdowne, which is fully inside Upper Darby Township and about 500 feet from Lansdowne Borough. Streetlights and other road improvements were on the minds of 19th-century Narberthians when they considered forming their own borough. But the burning of a church was the last straw. In the 1890s, Narberth Presbyterian Church turned to ash before volunteer firefighters could reach it. The residents of Narberth wanted their own, more-local services and incorporated as a borough in 1895. That was five years before Lower Merion assumed its current status as a first-class township, notes lifelong Narberth resident Edmund "Ted" Goldsborough. "Narberth didn't really break away," said Goldsborough, former president of the Lower Merion Historical Society.